The #JamBike 2017 is on! Our two crazy jamtivists, Samuli Jääskeläinen and Jonne Harja are attempting an an unprecedented challenge titled JamBike. 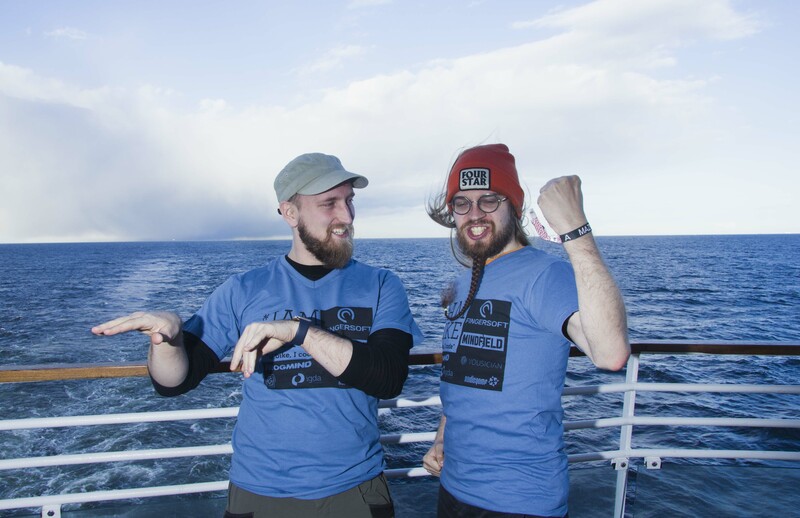 This game development journey takes them from Helsinki to Malmö, 12th – 17th May, creating a game while they cycle. The duo travels with a tandem bike creating as green game as possible. The game jam happens on the saddle: one codes, the other one steers and solar panels produce electricity. Final destination of the team is Nordic Game Conference where the game will be displayed for fellow game developers around the world. The trip is accompanied with a custom made computer attached to the bike and lots of Finnish game developer insanity. 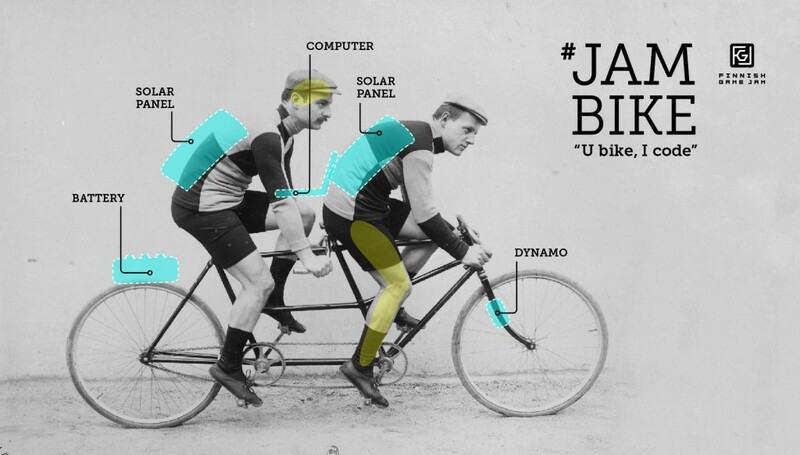 The idea for the JamBike 2017 was originally conceived at Indie Beer meetup at Helsinki as joke about making a game on a bike. A year later, the gag is turning into a challenge with a serious intent. The goal of the insane experiment is producing a game 100% with renewable energies and encouraging healthy living habits – and of course like all other crazy game jams out there: creating a game under interesting development constraints testing the limits of the game creators. The experiment is supported by us and sponsored by a handful of courageous game companies including Fingersoft, Mindfield Games, Frogmind, Yousician and Two Men and A Dog. The Nordic Game Conference is hosting the first view of the jam game. Finnish Game Jam ry is proud to announce our fourth jam scholarship! For the second time around FGJ is supporting one jammer’s participation to the Train Jam 2017 (United States). Finnish Game Jam organization is awarding a ticket to the legendary Train Jam (http://trainjam.com/) and a 1000 Eur travel aid to a prominent jammer willing to represent Finnish game jamming scene in the United States and bringing back the lessons learned to the community. The candidate for the scholarship is selected based on the applications sent prior to Monday 30th January 2017 16:00 (GMT +2). A great applicant has participated to at least one FGJ game jam between 2010-2017 and has a broad experience on game jams in Finland (and/or elsewhere) as well as an interesting portfolio of game jam projects. Train Jam is a great opportunity to network with international game jam community and to spend an amazing trip from Chicago to San Francisco right before the GDC (http://gdconf.com) week. Train Jam 2017 is the 4th organized annual event of 52h (or in case of the train being early on final destination, only 51h) game jam taking place in a moving train. The jam is organized by Adriel Wallick, independent from Finnish Game Jam organization. More information on the jam can be found at the jam’s Facebook Event page and the tickets can be acquired from the jam’s Eventbrite page. All other inquiries can be directed to: aakoo@finnishgamejam.com. We want to thank everyone who stood against the IeSF on the issue of men-only tournaments and those who supported our message to the Assembly organisers to not take part in events supporting discriminating practices. Due to the vocal gamer community and the outrage in social media and news, the IeSF moved quickly and changed their eSports gender policies. Following the IeSF’s rule change, the IeSF competitions at Assembly are now open for everyone. This is an important achievement for eSports, the gaming community and equality in general. We would like to emphasise that FGJ will never be part of any event which supports – directly or indirectly – any discrimination based on race, gender or sexuality and we are ready to act decisively in order to ensure an equal and comfortable game jamming environment for everyone. Finnish Game Jam loves Assembly and we are happy to continue the organising process of ASM FGJ 14 to provide more opportunities for the jamming community to collaborate and share their passion for game development. Stay tuned for the registration for ASM FGJ 14 – See you at Assembly Summer 2014! We are preparing for the Global Game Jam 2014 event. At least 13 different locations in Finland will be taking part to a massive, truly global game development challenge where people all around the globe develop games within the same weekend – in less than 48 hours. For the Finnish Game Jam, 2014 will be the fifth year of participation and we are anticipating over 600 Finnish game developers, students and hobbyists to register. The FGJ2014 event is supported by Grand Cru and SITRA among numerous local sponsors and enablers. Finnish Game Jam (FGJ) is a non-profit organization supporting the game making hobby and organizing game jam events in Finland.